Weekend mission: simultaneously maximize relaxation and rowdiness. 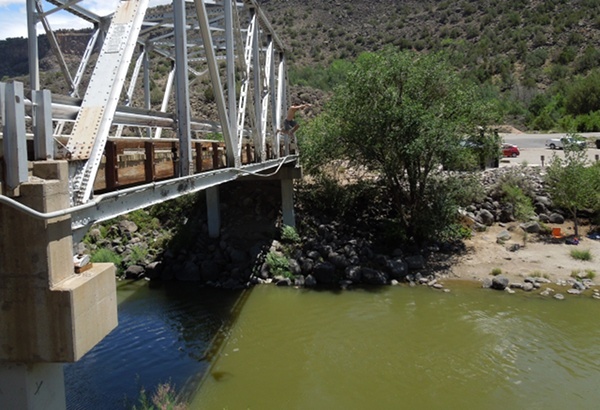 Start with a jump into the Rio Grande. We spent the afternoon fighting gravity at the Bat Cave. Micah on the 11- warmup. After a night of hanging with Miranda (so good to see you!) then a leisurely breakfast where Micah and I overheard the most absurd, ridiculous Santa Fe niche conversation possible, we cruised to Sandias for a noon-ish start on Thunderbird. Thunderbird is on Muralla Grande, a ~600 ft cliff a short distance below Sandia Crest. 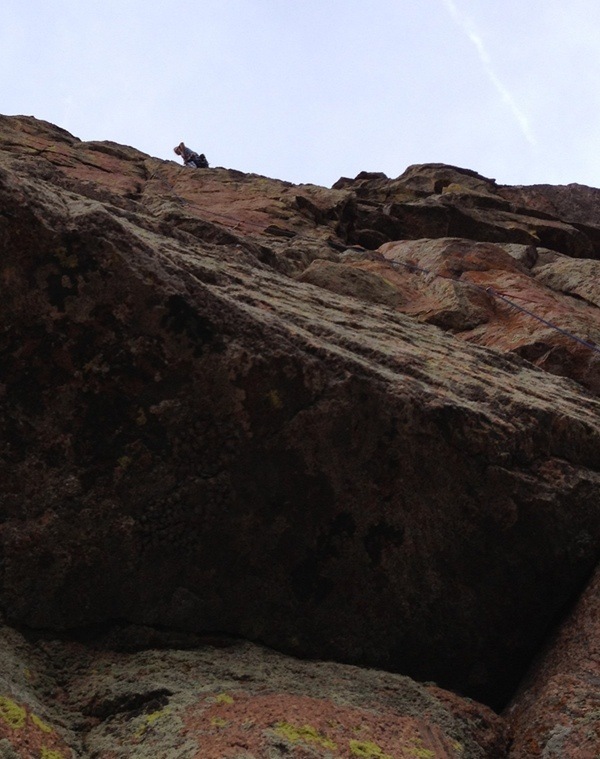 The top of the cliff is about 10 minutes from the road down a gaper-free climber's trail. Pitch one starts with a "difficult to protect" 10d corner that's wet right now from thunderstorm season. 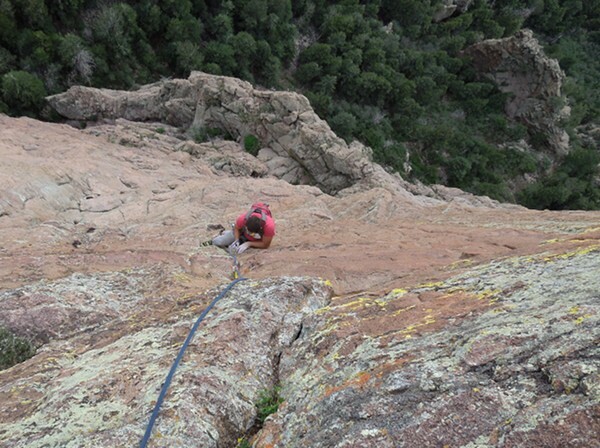 Then it pulls a sweet 11a roof on strenuous moves and stems before a fun traverse below another roof to a belay ledge. Micah pulls through the roof. The dark red, smooth corner below him is the part with the tricky pro. Pitch two provides more food for thought. 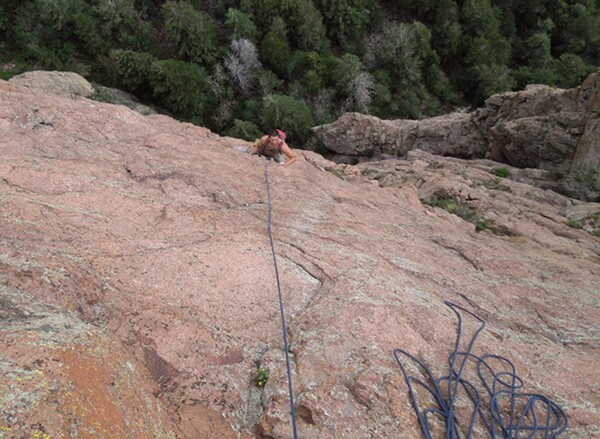 There is a bolt about 20+ ft above the belay. The bolt is followed by another ~20+ ft or so of fairly sustained 5.10 moves to a bolt tantalizingly perched above an overhang. I opted not to risk playing wrecking ball onto Micah when I saw an intermediate stance that offered some thin pro to the side. I got this picture of the bolt at the 5.11 crux when I was back cleaning my intermediate pro. The moves through and above the roof are highly entertaining. It took me some time to decipher the route on pitch three. There's a section of sweet 10+ face moves past a piton then a bolt. Micah passing the bolt. 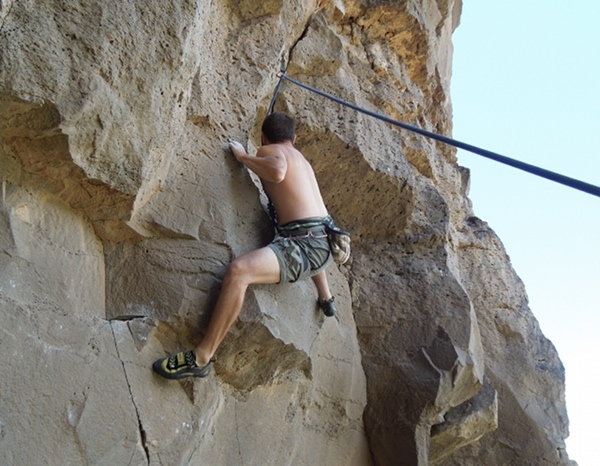 After the bolt, it's a game of find the belay and don't think about how far you've gone since that bolt. Pitch 4 offers a bit of respite. It's only 5.9+ and the pro is decent. Not sure how Micah felt about pitch 4. Pitch 5 is the money pitch. There's some 5.11 around a roof system on the lower part then a face with sustained thin 5.12- past several bolts. I was psyched to mostly cruise it. Micah moves toward the last bolt. There were some thin moves, cranking on crimpers while pasting feet above the last bolt. The difficulty relented but only relatively. 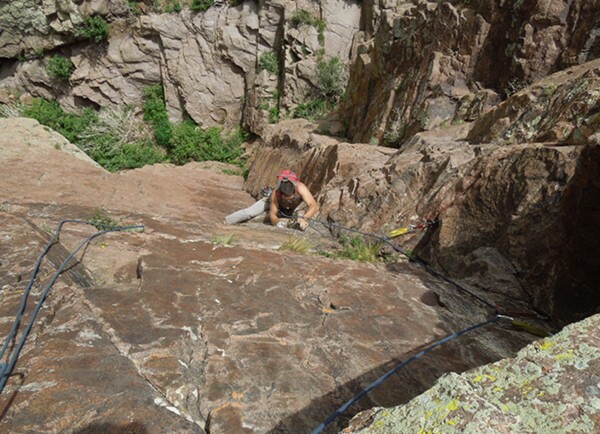 I was a good ways above the last bolt, thinking, "I really don't want to make those moves again," when I saw a nice place in a thin crack to sink a brassy. Micah makes moves below the brassy. 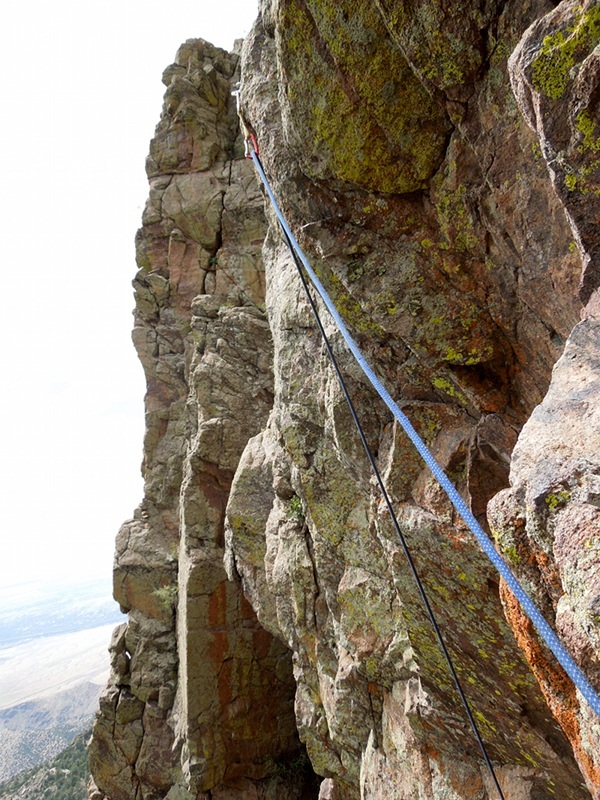 WOW that is one heckuva pitch of face climbing 500 ft off the deck. The sixth pitch has a one-move wonder 11a crux followed by a run up a gully. 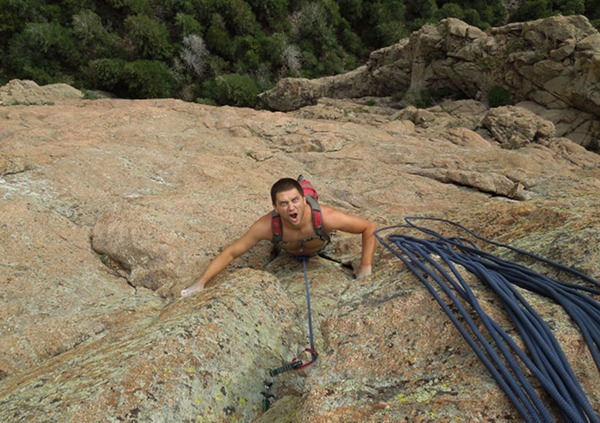 The look on my face atop p4 pretty much sums it up.... That route was very entertaining! Thanks Sky! 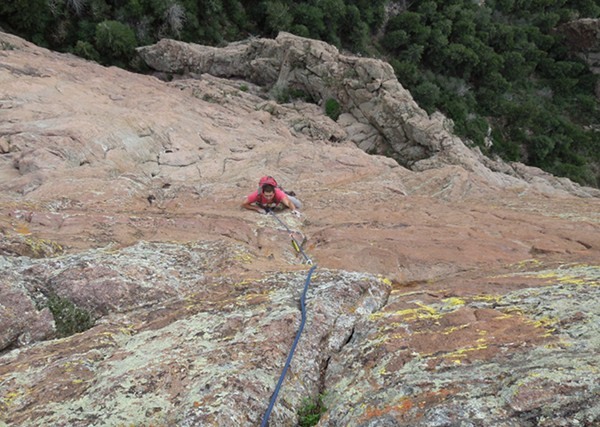 That's amazing you're getting onto 5.12 pitches in the Sandias! 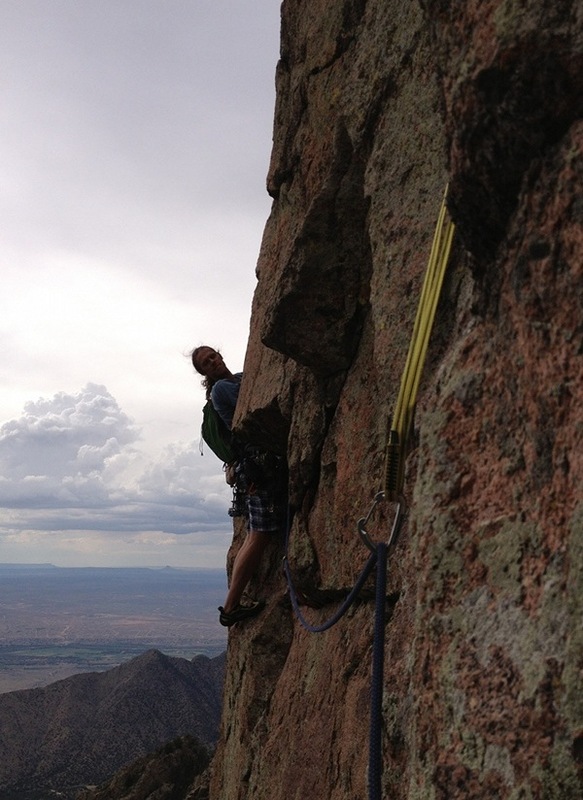 The climbs in the Sandias are heady and gnarly. That traverse section looks wild. Good job Micah for following Sky. Glad he found someone who enjoys the spank. George and I got a lead-swapping full team send of this yesterday. F yeah.